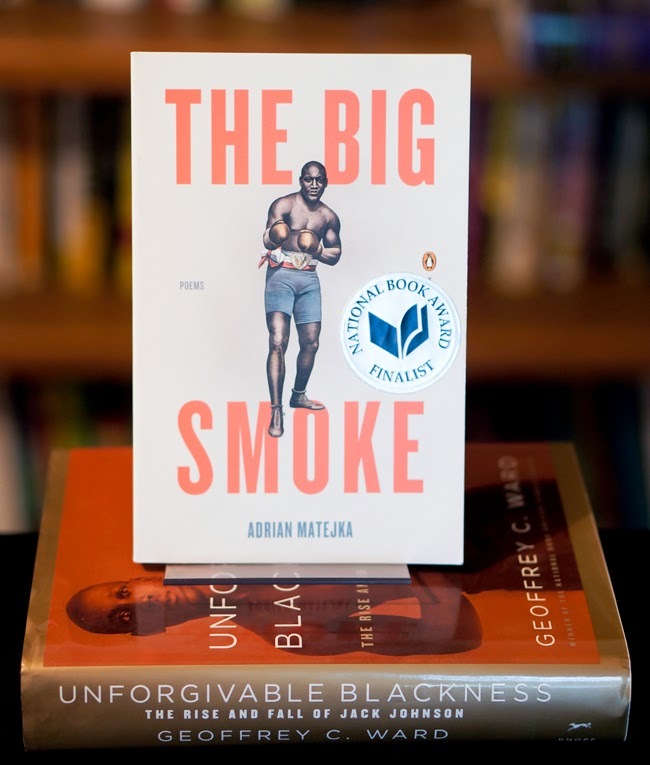 Going back to listen to some music by Jay Z helped me solve aspects of a riddle concerning Adrian Matejka's The Big Smoke and why several collegiate black men were drawn to the work. Jay Z's music, success, and popularity, especially among long-time fans, reminded me that he is often having a conversation with his listeners. There are countless examples, but let's take one from Jay Z's song "Where I'm From." At one point, he's mentioning a past moment when he was involved him preparing drugs to sell while "still using a hand-held weight scale." He immediately follows by saying to his audience, "You're laughing, you know the place well." That insertion suggests that those rap lyrics are in fact a disguise for a conversation among insiders. I suspect that large numbers of Jay Z's audience do not "know the place well." Yet, what is appealing for them is that they get to overhear a particular type of conversation. Long before Jay Z, Jack Johnson was a a wonderful storyteller, and Matejka draws on that with his poems. What makes The Big Smoke work for us in some respects is that the poems are, in some respects, a disguise for a conversation among insiders. As Matejka's Johnson describes his upbringing and experiences as a black man in America, some will nod because they "know the place well." Others will take interest because of the opportunity to overhear Johnson's inside conversations. There's a really long history of poets writing about paintings. Consider, to take only a few, W. H. Auden's "Musee des Beau Arts," William Carlos Williams's "The Dance," and Rita Dove's "Agosta the Winged Man and Rasha the Black Dove" among many others. By contrast, for Matejka, the muse is neither a painting or painter, but rather a marvelous storyteller.